Music is an important part of the learning experience at Clarence High School. Music classes are conducted, as a part of the curriculum, for all Students from Kindergarten to Class 5. The School has three Choirs (Kg, Junior and Senior) which actively take part in events both in School as well as outside. 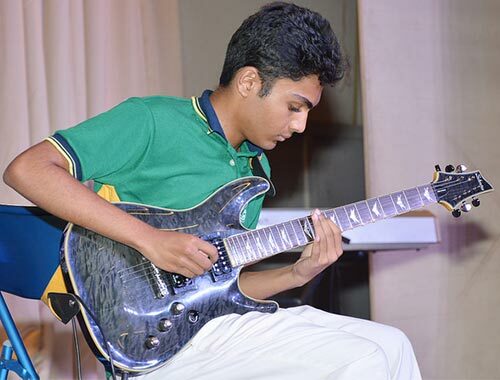 Various programs during the school year provide a platform for students to showcase their talents and skill in Music. Choir clubs are conducted as part of the extracurricular activities at School. Students who join are trained vocally and are taught to sing in harmony. The Music Academy offers music lessons, after school hours, in a variety of instruments namely; Classical Guitar, Acoustic Guitar, Percussion, Violin and Voice. Keyboard lessons will soon be available for kindergarten students. The Academy also offers to train students interested in giving Music Exams. Art is a place where children learn and develop essential skills while making a beautiful mess. At the Art & SUPW Classes, children derive many important benefits while working with creative projects. It involves structured activities to explore imagination with a specific goal in mind. It is , ‘Learning by Doing’!